Last week the FL Retail Federation announced its support for legislation to stop local communities from protecting their waterfront economies from fertilizer pollution. Click here to see the press release. 1. There is no “complicated patchwork of local fertilizer ordinances.” There is already regional conformity in fertilizer management; all but 2 of the nearly 40 gulf coast ordinances share identical standards that relate to retail sales - the required use of 50% slow release nitrogen and the 4-month rainy season nitrogen and phosphorous application ban. 2. Not one Pinellas County (the only county with sales restrictions associated with their urban fertilizer ordinance) retailer lobbied against the restrictions before the ordinance was adopted, and retailers have reported to county staff that fewer products on the shelves is a welcome change. That suggests the Retail Sales Restriction has had significant positive implications for Florida-based businesses; it has opened a door for Florida-based companies that have been ready to develop and provide ordinance-compliant products. Listed below are some of the Florida fertilizer companies that are meeting the new market demand for ordinance-compliant products and claiming more retail shelf space. 4. Strong fertilizer management standards do not put turf health at risk and any claims to the contrary are unsubstantiated claptrap. Urban fertilizer ordinances do not stop the maintenance of urban open space; they only require that the open space be maintained in a manner that is protective of local water resources. 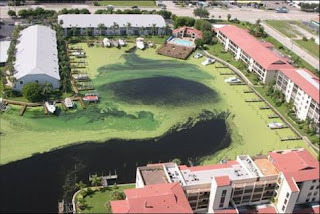 So, why would the FL Retail Federation spend time and resources to stop fertilizer pollution prevention at the local level? The Federation’s board includes leaders from Beall’s and Ron Jon Surf Shop. Beall’s sells fishing and beach attire to residents and tourists alike and Ron Jon’s relies on clean coastal waters so its customers can surf. There are few if any retailers in the state that do not benefit from the influx of tourists that come to enjoy Florida’s waterfronts. The Federation’s efforts to undermine water pollution controls that protect coastlines from harmful algal blooms is a mystery. Or is it? We figure the Federation’s position, so contrary to its own welfare, is coming from land-locked Ohio. You see, the Scotts Miracle-Gro Company (the “Turf Builder” people), based in Ohio, instead of producing a “Turf Builder” product that complies with Florida’s ordinances (as so many Florida companies have done - see list above), has spent its considerable resources lobbying against local fertilizer management. Scotts is the biggest turf fertilizer business in the nation and easily could have formulated a more sustainable product line. But they didn’t. In fact, since 2007 and 2008 when Sarasota, Charlotte and Lee Counties made the use of at least 50% slow release nitrogen illegal, Scotts has continued to sell its non-compliant products in those counties (making criminals out of unknowing county residents). Now, with the Pinellas County sales restrictions on non-compliant products, the Scotts folks are out of luck (there are currently no Scotts turf products on Pinellas retail shelves) and they are angry. And, it appears, pushing their weight around the Retail Federation. Scotts Miracle-Gro has shown its true colors when it comes to the environment in Florida and the Federation doesn’t care. Too bad, because the color of money is green; the Federation’s actions are putting Florida’s environment and tourist economy at risk and they may pay in the end.